Silverhome on the Water is an inn located just inside of Bravil's gate. It is found adjacent to the gate, across the street from the building which consists of S'krivva's and City-Swimmer's houses and next to The Fair Deal. The publican, Gilgondorin, buys potions and food while only selling the latter. The ground floor contains the reception area, a bar with a counter, and a dining room, while the rooms are upstairs. The room you can rent is on the second floor; the second to the right, just before the stairs. It is small and filthy, with a lower class bed and table. The other rooms aren't particularly better: the first on the right is locked and contains a lower class bed which you can sleep in. The one on the left, also locked, consists of two lower-class single beds, which are also free to sleep in. 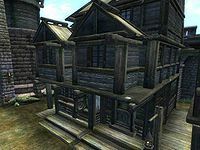 The third floor, which is locked, contains two other rooms: the one on the right contains two lower-class single beds and a Nirnroot plant, while the other, which is also locked, consists of two middle-class single beds. Unfortunately, none of these are free to sleep in. Esta página foi modificada pela última vez à(s) 05h28min de 17 de novembro de 2013.